The GWB software is fantastic! It is comprehensive and flexible, the two main things I look for. Can't believe I've only just found out about the GWB! The Geochemist's Workbench® has from its introduction in 1991 set the standard in geochemical modeling. More than 3000 copies have been licensed and installed in 66 countries around the world. With its crisp user interface, fully integrated graphics, highly optimized algorithms, and advanced software architecture, the GWB makes quick work of geochemistry tasks small and large. Already a GWB user? GWB12 is out most anticipated release ever! Generate phase diagrams and “true” activity diagrams, calculate fractionation of any stable isotope, set partial pressures, model isotope transport, and much, much more! A must-have upgrade for every GWB user. New to the GWB? The package comes in three editions that run under MS Windows (tips for Mac users). Look below to find the version that meets your needs. The Geochemist's Workbench® Professional edition is the complete software package. Create spreadsheets and specialty diagrams, trace reaction models, compute complex phase diagrams, and simulate reactive, bioreactive, isotopic, and colloidal transport. 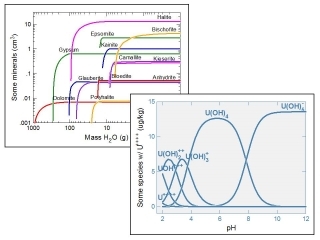 GWB Pro accounts for equilibrium and kinetic reactions in heterogeneous, dual-porosity media, including simulation of microbial metabolism and growth. Only the professional edition is multithreaded. And only GWB Pro lets you animate your results and create video clips in just moments. The Geochemist's Workbench® Standard edition is your choice for spreadsheets, diagrams, and multicomponent reaction modeling. 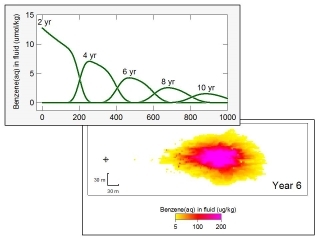 Plot how species distributions change, model water-rock interaction, and simulate fluid mixing. 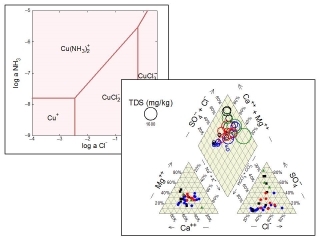 Integrate kinetic rate laws for mineral dissolution and precipitation, complex association and dissociation, sorption and desorption, redox transformation, and gas transfer. Trace stable isotope fractionation in reacting systems and model microbial metabolism and growth. The Geochemist's Workbench® Essentials edition performs the most common tasks in geochemical modeling. With a few clicks, you can balance reactions, figure equilibrium constants, and make Eh-pH diagrams. Computing speciation, saturation, gas pressure, and isotope distributions is a snap. The package features a spreadsheet designed for geochemical analyses. Instantly convert units or figure mineral saturation for all your samples. Create time series and cross plots, and ternary, Piper, or Stiff diagrams. And that's just the beginning.